We currently manufacture a compact Video Light which features a removable battery pack and bulb assembly which may be recharged outside the lamp body. This enables longer filming times on multiple dives, by changing cartridges when the batteries have discharged. As with our rechargeable torches, NiCd batteries are used for peak performance. The lights use 12 Volt Dichroic bulb units which plug into the battery pack. 50 Watt units are available in several beam spreads (See below), and 20 Watt versions are available to convert the Video Light into a powerful torch! 50 Watts, 60 degree spread beam, which gives good general coverage. 50 Watts,30 degree narrow beam, illuminating appr. 65% of the frame area.This illuminates more distant shots. 50 Watts, 10 degree narrow spot beam. 20 Watt units to convert to a torch of approx. 60 minutes duration. The unit has an M8 stud for direct connection to our Swivel (Supplied) Dimensions 75mm Dia.x180mm long. Weight 1.4Kg. Depth limitation 80 Metres. Negatively buoyant. Our Triple 50W Video Lamp is similar to the Single 50W unit, except it is larger. The body is manufactured from an Aluminium tube, with a clear front & rear lens. The rear lens is attached in place with lockable cam clamps. Both front & rear lenses are sealed by double '0'rings. The bulbs are switched individually, but all may be on at the same time, giving up to 150W of light. 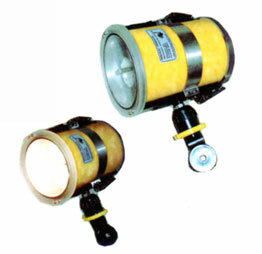 Battery & bulb/reflector units are housed inside the lamp, making for a compact arrangement. The lamp is supplied with a Swivel Arm, for fitment to our handle/arm on our Video housings. Dimensions 5 inches dia. X 6 1/4 inches long approx. Weight 2.5 kgs approx. Depth limitation 60 M / 200 ft. Negatively buoyant.